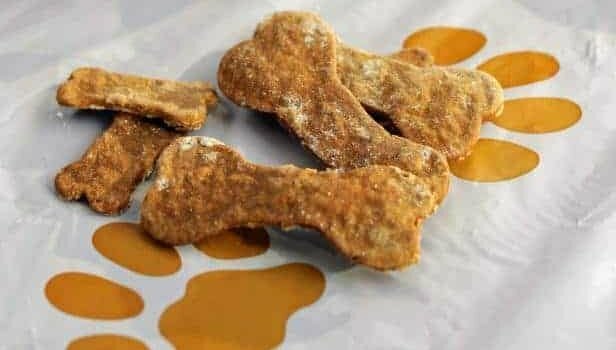 This sweet potato dog treat recipe is perfect for dogs that love cookies. We threw in some oats to make the pup cookies extra crunchy. Vitamin C naturally boosts the immune system and helps in the synthesis of collagen. Collagen is a protein is important in the formation of teeth, skin, bones, tendons, and cartilage. If your dog receives his regular dose of vitamin C, he will recover faster from play and has a lower chance of developing muscle or joint inflammation. So yes! Let Charlie have his healthy serving of sweet potatoes. If you are introducing sweet potatoes to your dog the first time, it is important that you do so moderately until he grows accustomed to the new palate. And we just have a sweet potato recipe to help you with that. On a flat surface, sprinkle some flour then roll out the dough. A thickness of about 3-4 mm is perfect. Using a cookie cutter to cut perfect shapes out of the dough. Having several different cookie cutters allows you to bake the best assortment of treats. Place the baking tray aside for the doggy treats to cool. That’s it! Now share your tasty creation with your pup and let him nibble in approval. Store the cookies in an airtight container to keep them fresh for longer.